After an awesome time at the Padres Social Media night, I got too lazy to write a nice wrap up. I’ll get it tomorrow. Maybe. Regardless, it was a pleasure to meet the whole Padres Public crew, Friarhood Steve, Jbox and Jon from Gaslamp Ball, and the random Asian guy in a Gwynn jersey who I accused of being Dex. THAT’S RAYCESS! 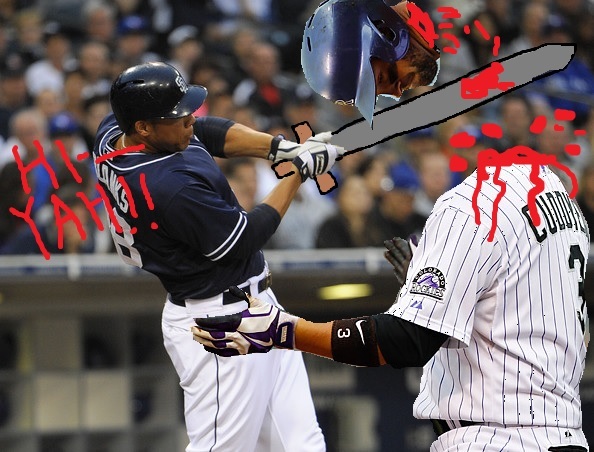 Instead of writing that wrap-up, I drew this picture of Kyle Blanks beheading Michael Cuddyer before the Padres get up to a TWO game winning streak tonight. Andrew Cashner is pitching so we can expect much deer dressing.